Since the election of Hugo Chávez as president of Venezuela in 1998, left or left-center governments have come to power or remained in power in Argentina, Bolivia, Brazil, Cuba, Ecuador, El Salvador, Nicaragua, Uruguay, Venezuela and some of the smaller Caribbean states. Left-wing governments have been ousted by coups in Haiti, Honduras and Paraguay, and by this year’s elections in Guyana. This “Bolivarian pink tide” represents one of the greatest challenges to international monopoly capital and U.S. hegemony over the region since the fall of the USSR around 1990. Moreover, the process of regional integration which the Latin American and Caribbean left-wing governments have undertaken has contributed to a rise in living standards for majorities in each country. New structures of regional cooperation and economic integration have included ALBA (the Bolivarian Alliance for Our America), UNASUR (Union of South American Nations), the revitalized MERCOSUR (South American Common Market), PETROCARIBE, CELAC (Community of Latin American and Caribbean States), and BancoSur (Bank of the South, a new South American development bank). These bodies have challenged the hegemony of the U.S. in the Western Hemisphere and have built new trade and political relationships with the BRICS group of emerging powers (Brazil, Russia, India, China, South Africa). However, right now these governments have hit a rough patch. Several key countries are experiencing economic slowdowns, there is new instability, and the historic advances, though not reversed, are threatened. The right wing is making a coordinated regional push to restore its power, counting on support from the U.S. in doing so. Left and left-center governments emphasize right-wing sabotage as being at the root of the current difficulties, and there is certainly an element of that. The right and the ruling class, including corporate-controlled media, rather, blame everything on the mistakes of the left and left-center governments. But there are some general characteristics of the whole panorama that constitute systemic challenges to the “Bolivarian” project that need to be overcome. First of all, their options are severely limited by the fact that they have to work within the overall framework of the neoliberal imperialist world order. I prefer the definition of imperialism used by V.I. Lenin in his 1917 book “Imperialism: The Highest Stage of Capitalism.” For Lenin, imperialism is not a mere policy option of this or that government in wealthy capitalist countries, or just a conspiracy hatched in the basement of the White House or the Quay D’Orsay. To Lenin, imperialism is nothing less than the way that international monopoly capitalism is organized in both its economic and political dimensions. Though some aspects of imperialism have changed since Lenin’s day (which I will refer to below), its major features remain, namely extreme inequality of wealth and of power between the wealthy “developed” countries such as the U.S., Canada, Western Europe, Japan, Australia, New Zealand and South Korea, and the poor countries of Africa, most of Asia, and Latin America. In addition financialization, pointed to as an essential feature of imperialism by Lenin, has mushroomed to an immense degree since 1917. 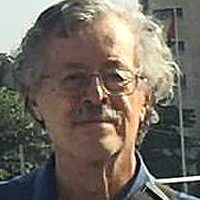 The phrase “corporate globalization” is not an adequate gloss for the concept of imperialism, because it implies that the multinational corporations act alone in promoting their worldwide interests; in fact, the actions of the state, and of groups of states, in the wealthy capitalist countries are essential for the corporate agenda to be advanced worldwide. The big multi-state entities which push the agenda of the transnational corporations, such as NATO, NAFTA, CAFTA DR, other “free trade” pacts, the World Trade Organization, the International Monetary Fund, the World Bank and the proposed Transpacific Partnership (TPP), Transatlantic Trade and Investment Partnership and Trade in Services Agreement are primarily negotiated and established by national governments individually and collectively, with the wealthy capitalist countries calling the shots, and the poorer countries falling into line, either willingly or under duress, depending on the political nature of their own governments. So “corporate globalization” is a term which tends to let the state off the hook. Secondly, with the exception of Cuba, none of the Western Hemisphere countries with left or left-center governments are actually socialist. The leaders they have elected are themselves sincere socialists, and they and millions of their followers aspire to creating new forms of socialism, but they have not achieved this yet. (Even Cuba’s leaders modestly say they are trying to build socialism, not that they have perfected it.) The old ruling classes, while ousted from some key positions in the state apparatus, still dominate others and most of the “commanding heights” of the economy in each country. The private press and media are just as much under the control of the wealthy in the Bolivarian countries as they are in the U.S., and work assiduously against progressive policies. For example old ruling-class interests control wholesale and retail trade in staples and other items in Venezuela, giving them leverage against the Bolivarian state in that they can influence prices and the supply of goods. In Bolivia, old ruling groups in Santa Cruz province in the east of the country have caused major headaches for leftist president Evo Morales. Moreover the old ruling classes are allied with the multinational corporations and the governments of the wealthy developed countries, and coordinate with them in their never ending efforts to return to full power in the presidential mansions, the legislatures, the military, the bureaucracy and all other state institutions. The fact that Bolivarian “pink tide” leftism has to work within the confines of these two “straightjackets” – imperialism and the retention of massive power by “their own” ruling classes – is a severely limiting factor in what they can achieve in the short run. Also, the mixed nature of the main left and left-center parties in power has to be borne in mind. Although almost without exception the communist parties are in strong support of the Bolivarian dynamic, these are not the largest parties anywhere except Cuba. The big parties in power such as the Workers’ Party (PT) in Brazil, the Venezuelan United Socialist Party, the Alianza País coalition in Ecuador, etc., are a mixture of Marxist, Christian left, social democratic, nationalist, left-Peronist and populist tendencies, which creates its own problems, internal conflicts and limitations. A major one is the fact that many of the left-wing governments have inherited an economic model based on export of commodities, which, although it may bring a lot of capital into the country, does not conduce to balanced development. And it leaves governments and nations at the mercy of commodity prices which they don’t have many ways to control, even when, as in the case of Venezuela’s oil, the industries in question have been nationalized. In Latin America, advances have been achieved by harnessing profits from the international sale of oil, natural gas and mining products for the purpose of raising the abysmally low living standards of the working class and poor agricultural population. But over the last year, the price of oil in the international marketplace has dropped by half. Venezuela’s economy is severely stressed by the oil price drop; efforts by the Venezuelan government to get OPEC to cut back on production and thus support oil prices failed due to opposition from Saudi Arabia. This is not a new phenomenon or one confined to the Western Hemisphere; in South Africa, for example, the issue of the fluctuating price of mining products (gold, platinum, etc.) has been a cause of instability since pre-apartheid days, and the current slump in gold prices is having a deleterious effect. Every progressive government in Latin America has had the ambition of employing profits from commodity sales to diversify the economy by developing new industries, modernizing agriculture, etc. But this takes time and is far from completion. Meanwhile a country like Venezuela has to import a large proportion of the goods its people need for everyday life, and the lower the price it can get for its oil, the more difficult it becomes either to keep on importing all these things, or to capitalize its own projects in the diversification of production, while at the same time continuing to improve the living standards of its poor and working class majority. Then there is the debt trap. For poor countries in the past, the only way to get money for development projects has been to borrow it (often via the International Monetary Fund and World Bank), and the only way to pay it back has been to keep living standards low. Nevertheless the debt of many countries turns out to be unsustainable, and efforts to get out from under it are extremely difficult and traumatic. Argentina, for example, had to live under a military dictatorship during the 1970s that was as corrupt as it was bloodthirsty, and which got the country deeply into debt that had very bad long term consequences, some of which are still being felt today. Another problem is that of balancing economic development vis-à-vis environmental protection and sustainability. There are legitimate demands by environmentalists and, in some cases, indigenous populations to limit certain kinds of growth. But to stop all development in the interest of protecting the rural environment is not a viable option because urban poor and working-class populations demand improvements in their living standards, including jobs, housing, transportation, electricity and other things, all of which have their impact. Left-wing governments like those of Bolivia, Ecuador and others which rely to some extent on extractive industries have had a difficult time managing this balance. Most of the countries in the region are ethnically diverse, and specific ethnic populations have their own longstanding demands, including retention or regaining of traditional lands, ending of racist discrimination, and protection of language and cultural rights. In each country, part of the promise of the left in power has been to attend to these demands; yet unity is also essential for the Bolivarian project to move forward. Various local elites and also agencies of the empire, including corporate-funded non-government organizations, as well as those receiving money from U.S. government agencies such as USAID and the National Endowment for Democracy, have been quick to move in and try to play on these ethnic differences. Recent mass disturbances in Ecuador are a case in point. There have been similar dynamics elsewhere. Finally, there is an issue which must be of concern to all socialists everywhere, which is how to really build socialism rather than letting a sort of paternalistic clientelism (or patronage politics), perhaps using socialist phraseology, take over the Bolivarian project and destroy its socialist potential. The left-wing governments in Latin America have been correctly concerned with quickly raising the horrible living standards of millions of their people as an immediate, urgent priority. They have been successful in pulling millions out of poverty, and of vastly improving health care, schools, housing and other basic public services. In doing this, they have also created the mass base for governing, and, not least important, for continuing to win elections and staying in power. This last point is the focus of major discussions on the socialist left worldwide, not just in Latin America. The task is in reality one of reconceptualizing what socialism actually is. That, in turn, entails careful study of the reasons that the socialist project in the USSR and Eastern Europe collapsed so spectacularly by 1991. A lot of the discussions on this topic that I have heard and read range from frustrating to useless, rehashing old sectarian battles that have little to teach people in places like Latin America. If Marxists can’t come to grips with all this, we can’t contribute much to the practical tasks of those who are trying to build socialism in extremely difficult circumstances. Before I move on to the topic of internationalist solidarity, let me just point out that whatever the problems of the left and left-center governments, the situation of the other governments in the region is much worse. The president of Guatemala has just resigned and been arrested for corruption. Things are trending the same way in Honduras. Both of these countries are mired in intractable poverty and violence. Mexico is in crisis, with a slumping economy, a shockingly corrupt political class, and major threats to public security. Colombia, Paraguay, Peru, Haiti, the Dominican Republic are in notably bad shape. Even Puerto Rico, controlled and heavily subsidized by the U.S., is swamped by unsustainable debt and facing economic collapse. Badly as things are going in the Bolivarian pink tide countries, they are going much worse in Latin American countries that have simply gone with the flow of neoliberal imperialism. How can the left in the U.S. help? First of all, at the start of this piece, I noted that there were some differences between the imperialism of Lenin’s day and that of our own time. One difference that is extremely important for our practical work is that while in Lenin’s day the imperial plunder of the “colonies and semi-colonies” allowed the bourgeoisie to partly satisfy short-term demands of the working class in the imperial centers, this is no longer happening. On the contrary, the shift to outsourcing of industrial production and jobs to areas of the world where the cheapest labor can be found has the opposite effect, of dragging wages down everywhere, a dynamic that began in the 1950s and has reached a fever pitch today. Under so-called “free trade” regimes, which are not mainly about “reducing trade barriers” but rather about enforcing corporate-designed rules and limiting the power of the governments and people to have any control over what corporations can and can’t do, austerity, deregulation, privatization and repression are applied everywhere in similar ways, both in rich countries and poor. More than one person has described this as the “third worldization” of the working class and masses even in the wealthiest and most “advanced” countries. The environmental degradation and global warming as well as instability and conflict that characterize the current phase of neoliberal imperialism also affect everybody, in rich countries as well as poor. Countries like Greece that try to break away from this pattern are in for a severe mauling by the wealthier and more powerful states like Germany. This creates a more immediate communality of interests between workers in the rich countries and workers in the poor countries. But it is not always perceived that way by the former; there is still a tendency in the U.S. especially to frame the issue as one of the workers in the poorer countries “taking our jobs,” a divisive formulation. The left in the U.S. and the other wealthy countries should therefore undertake, with greater initiative and energy, the task of building international working-class and all people’s solidarity against neoliberal capitalism and imperialism, and in support of those countries which are working, even if only partially, to break away from monopoly control. Changes in U.S. labor in recent decades are opening up new possibilities for this type of solidarity work. Old Cold War attitudes under whose influences much (but not all) of U.S. organized labor collaborated with our government’s efforts to undermine left-wing labor organizing in Latin American countries have been fading, and there have been genuine breakthroughs in positions taken by the AFL-CIO and individual unions opposing aid to repressive regimes in Central America, and in support of independent unions in Mexico. U.S. unions are also taking on major solidarity roles in Colombia and elsewhere. Of signal importance has been labor’s opposition to the Transpacific Partnership. Opposition to the Vietnam War, organizing against the apartheid regime in South Africa and against the U.S. sponsored “Contra Wars” in Central America, and then against the Iraq War, began to help break us out of this pattern. The changes in organized labor have promise for greatly expanding the mass dimension of anti-imperialist solidarity work. Ways have to be found to point out to U.S. workers of every kind that what U.S. corporations and our government do to the mass of the population in a poor country hurts the interests of workers here. And conversely, advances in countries like the Bolivarian group are very much in the interests of U.S. workers. This means showing the U.S. workers and masses, also, that U.S military interventions, direct (American boots on the ground) or indirect (subsidizing or “training” – School of the Americas style – other countries’ military and security forces to do the dirty work) almost always lead to greater poverty and suffering in other countries, and by doing so harm U.S. workers also. This is why such adventures need the fig leaf of “humanitarian intervention,” a fraud which must be exposed. U.S. working-class people are also harmed by the terrific waste of money on the bloated military budget, which does not contribute to the security of our people but rather undermines it by stealing resources that could go for schools, health care, infrastructure, jobs and environmental protection. There are still many obstacles, but the possibility of creating unprecedented levels of international working-class and all-people’s unity against the common corporate, imperialist enemy are getting greater every day. We can do it, we must do it, and we will do it! Note: Thanks to Art Perlo for his comments on an earlier draft. 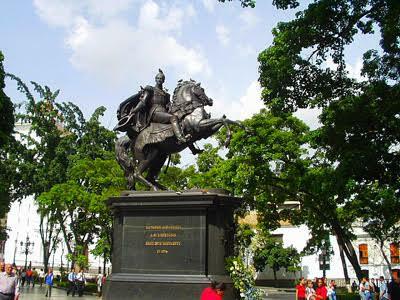 Photo: An equestrian statue of Simón Bolívar, “The Liberator,” Plaza Bolivar, Caracas, Venezuela. Kinori, public domain.